Breakfast is the most important meal of the day, and diner is together-time - but why should we compromise on lunch? Because we believe that lunch should be enjoyed, even on weekdays, and at a reasonable price, we’ve designed our own solution: the Lunch Prix Fixe. 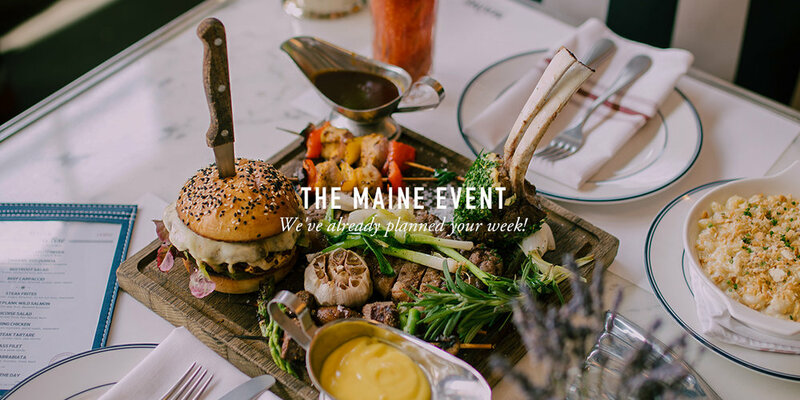 Crafted specifically for food lovers on a tight schedule, looking to make their business meeting a little more exciting, the Lunch Prix Fixe gives you the choice between four starters, six MAINE courses and a dessert. And because lunch wouldn’t be lunch without wine, you can pair your meal with a glass of any of our house wines. Red, white or rose - it’s all up to you! Lunch Prix Fixe runs from Sundays to Thursdays, click here to book your table. Hot off the Grill, The MAINE Oyster Bar & Grill is thrilled to introduce Oh My Grill! What better way to celebrate a long and abstinent January than by falling, in a spectacularly calorific fashion, off the wagon in February? Enjoy all of our greatest hits, tacos, truffle pizza and more with a Surf and Turf Grill menu that will make grown men cry. Fridays & Saturdays 12pm till 4pm.